I always love to receive my order from Omaha Steaks and so I wanted to do an Omaha Steaks review in case you were curious about what types of things one gets from a regular order. My husband and I are absolute foodies. Sure, we love things that sparkle and shine. But give me something that sizzles any day of the week and I will be good to go. You want to make a girl happy? Cook her a great meal (and then do the dishes AMIRIGGHHTT???) LOL! Take a look at my Omaha Steaks review and enter for a chance to win a package of your own! This is a good one, folks. Here’s what I love about being an Omaha Steaks customer. Not only is the process convenient, but the products are TIMELY. Yes, you are always going to receive TOP quality meats, sides, and desserts. That should go without being said. Omaha Steaks is over 100 years old and they pride themselves on being America’s Original Butcher. That means they want to give you the best cuts – the ones that they bring home to their own kids! But I want to talk to you about the holidays – because that’s where we are. If you take anything away from this Omaha Steaks review – start with THAT. 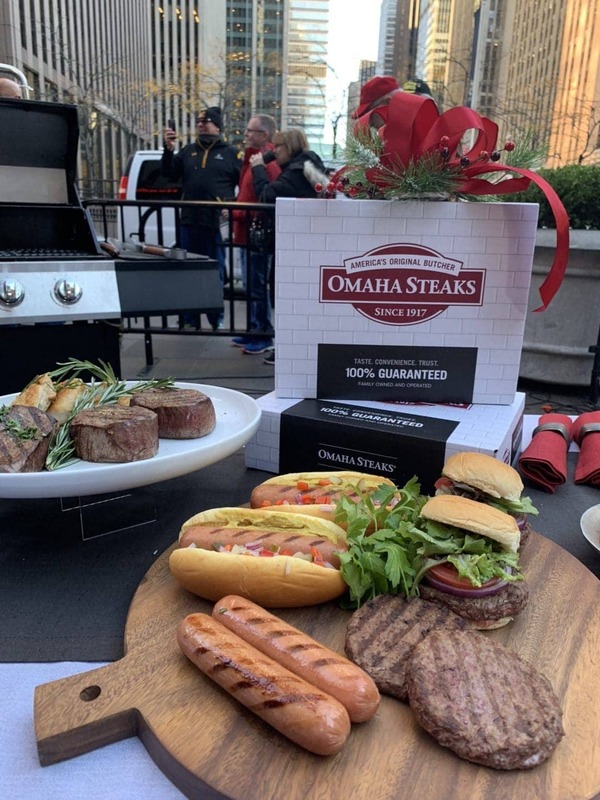 Thanksgiving is a few days away and if you go to Omaha Steaks right NOW you will find a TON of packages that will HELP YOU HOST your family and friends with ease. They know what is going on and they want to lighten the burden. I love this! Order your entire Thanksgiving meal ahead of time and then spend your entire party mingling with guests. Same for Christmas or Chanukah or any other beautiful day you celebrate. Don’t really want to think about the holidays because grandma still has you covered? No problem. How about any given Sunday? Think ahead and schedule out your meals. One pan skillet dishes, slow cooker ideas, prime meat cuts, hams and turkeys – you name it. Packages that include everything you need: protein, starch, vegetable, and dessert. They have those, too! Omaha Steaks has become a staple in my house and I am so thankful for it! I think the main GOAL of this Omaha Steaks review is to get you to REALIZE that this brand is not only about red meat. Now that I am all done with my Omaha Steaks review, I want you to try to win a package of your own. Use the form below to enter to win one of their most popular sets – The Tasteful Gift. It retails for $69.99 and is their key package for this holiday. What will you receive as part of The Tasteful Gift package? I mean – can you stand it? Use the form below to enter!! Contest will stay live for 2 weeks. Best of luck! 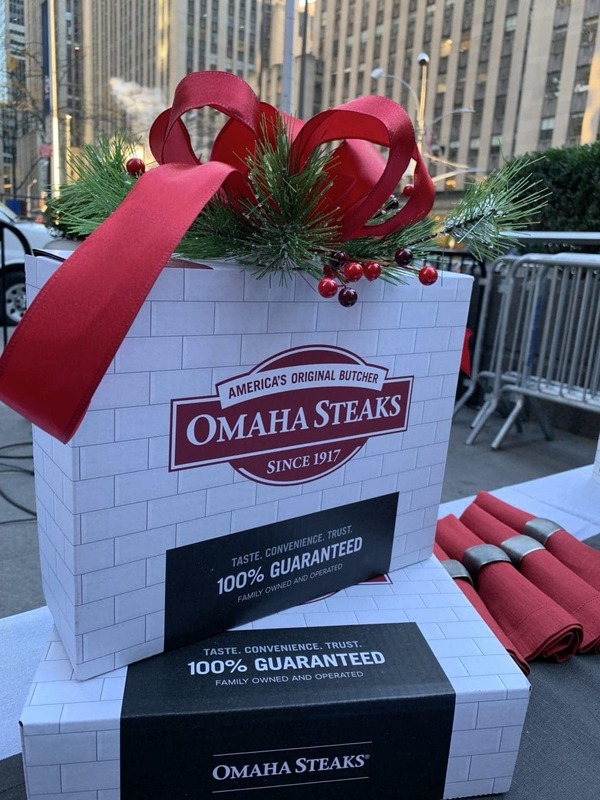 This post was written in paid partnership with Omaha Steaks. I’d like to try the Beef Tenderloin Steak. I want to tr the filet mingons . 11/14 I’d like to try filet mignon. I would love to try the Filet mignon! We LOVE filet mignon, so I would try that! I’d really love to try the Filet Mignons!! look so good, I’m drooling here. I love a good filet mignon! That is the first one I’d try! I’d love to try the Filet Mignons. I haven’t had it in years. I would really really love to try the filet mignons! YUMMY! I would like to try the Beef Strip loin steak. Thats cheesecake looks amazing mouth watering i need it in my life!! We would love to try the Beef strip loin steak . My husband loves this cut. Ive always wanted to try so many different items. The crockpot recipes or the cakes they all look so yummy. I would love to taste the top sirloin steaks. We love a good steak! I would like to try the filet mignon. I would love to try the filet mignon!!! I would love to try the Ribeyes. Happy Holidays! I’d like to try the Beef Strip Loin Steak. 11/15 I’d like to try filet mignon. Would love to try the filet mignon. Yes, would love to try the filet mignon. My husband has several heart condition and he is allowed to have filet mignon and loin also. I love getting their boxes. Their creme brulee is amaze balls! One of my first choices would be the filet mignon. I’d like to try the Burgers. 11/16 I’d like to try filet mignon. Ribeyes have my vote! Those are my favorite! The top sirloin steaks sound really good too. I would love to try the Filet mignon!! I’d like to try the Franks. I would love to try the sirloin steaks. They look fantastic! 11/17 I’d like to try filet mignon. I’d like to try the Boneless Pork Loin Chops. I’d love to try the Beef Steak loin strip. I love to try the filet mignon. It has been over 10 years since I have had filet mignon so would love to try these. I would love to try the beef tenderloin. it has been a long time since I had steak. I would also like to try the Boneless Pork Loin Chops. I want to try the pork chops! I want to try the beef tenderloin steaks. 11/18 I’d like to try filet mignon. I want to try the filet mignons!! I’ve never had Omaha, but I’ve been wanting to try them. I would love to try the Filet mignon!!!! The Bee Loin Strip Steaks! The top sirloins cooked Bourbon Street style! [This would be a perfect addition to the new grill that I just got for my husband! I’d like to try the Potatoes Au Gratin. I’d love to indulge with the Filet Mignons! I’d be up for some Filet Mignon! Would love to try those pork chops! I would like to try Beef Tenderloin Steaks! The top sirloin looks amazing!!! 11/19 I’d like to try filet mignon. I would love to try the Filet Mignon~! Haha, I want to try those massive beef franks, and they ARE beautiful…not weird at all in my book. Filet Mignon rules in my world. (I feel bad for not saying a steak, but….) I’d love to try the cheesecake! I would love to try the Filet mignon !!! I would also love to try the Beef strip loin steak which I have never had the opportunity to try. 11/20 I’d like to try filet mignon. the Filet Mignons is on top of my to-try list! Love Omaha Steaks! The filet mignon is really good! Would love to try the pork chops. I want to try the filet mignon. I’d like to try the Chateaubriand. I would love to try the Filet mignon !! I would love to try the tasty pork chops! Would love to try your Filet Mignon. Yummy! 11/21 I’d like to try filet mignon. Filet Mignons !! so yummy I need them in my tummy!! I would like to make the Chateaubriand. It looks wonderful. I would love to try the Filet mignon !!!! Chateaubriand sounds really good to me! I’m excited to try the Boneless Pork chops. I would love to try the boneless pork loin chops. 11/22 I’d like to try filet mignon. The filet mignon. Thank you for the chance! I would love to try the Filet mignon !!!!! I would like to try the franks! 11/23 I’d like to try filet mignon. I would love to try the Top Sirloin! The beef strip loin steaks are something I would love to try. Filet Mignon for me please!! 11/24 I’d like to try filet mignon. I would really like to try the Beef Tenderloin steaks. I want to try the Filet Mignons with my family!! I would really love to try the Filet mignon! I would also like to try the franks. The Boneless Pork chops look good also . I would love to try them. 11/25 I’d like to try filet mignon. Filet mignon is my fave! I would love to try the Filet Mignon. I would really love to try the Filet mignon!! Would love to try the Beef strip loin steak. I would love to try Omaha Steaks burgers as well. 11/26 I’d like to try filet mignon. Filet Mignon is the family favorite. I’d love to try their Filet Mignon. The beef lion strips look delicious. The cheesecake sampler would also be a big hit . Filet mignon all the way!! it’s my absolute favorite!! I would like to try the Filet Mignon for sure! I would like to try their 1-Step Rapid Roast Individual Beef Wellington. I would really love to try the Filet mignon!!! I would love to try the filet . 11/27 I’d like to try filet mignon. I would love to try the pork chops! I would love to try the Filet Mignon steak. Love the beef tenderloin steak! I want to try their boneless pork loin chops. I’d love to try the filet mignon! It’s hard to choose so many great options. I would really love to try the Filet mignon!!!! I would love to try their Filet Mignon! Oh MY GOSH! I am starving now!! I would love to try the Filet Mignon and of course the Beef Tenderlion steaks YUMMMMMMM! The Filet Mignon is calling my name! I would like the Filet Mignon steaks!